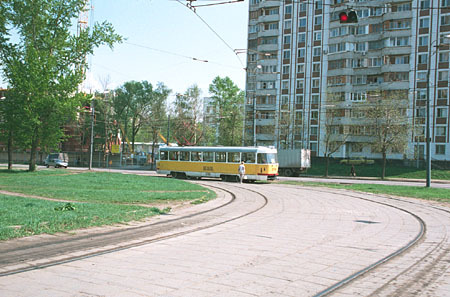 This terminus was built in 1966 as a final destination for a new line along Zhivopisnaya Street, and regular service here was started on January 10, 1967. Originally the terminus was named Novokhoroshevskoye Shosse, and some years later this road was renamed after the famous russian marshal Konstantin Zhukov who was one of the main leaders of the Soviet Army in its fight against the german Nazi during the World War II. The loop is located in a very nice place, on a bank of Moskva river and close to the well known recreational district Serebryaniy Bor (Silver Forest), with its beaches and dachas. A track enters the terminus and branches. There are only two tracks in this terminus, but rather long ones. 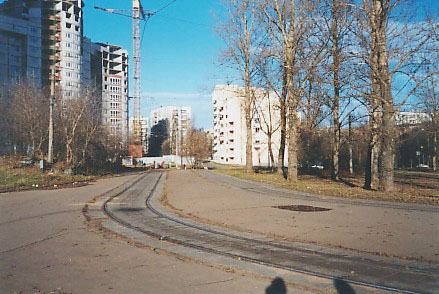 The terminus tracks encircle a small park, and in turn are encircled by new apartment buildings. 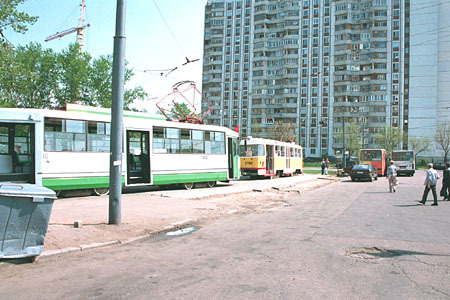 Until 2002, no tramcar manufactured in St. Petersburg ever run in Moscow. This is the exception: #3001 of model LM-2000 was made specially for Moscow as a prototype; this vehicle after due testing was put in a regular service on route 28. 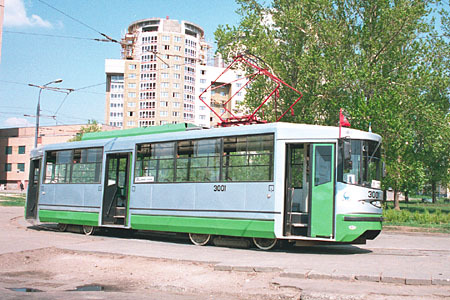 Later, in 2004 more St. Petersburg made trams entered service in Moscow, now being of type LM-99. 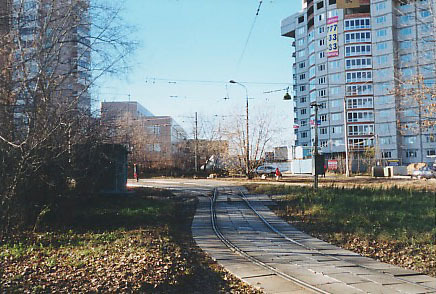 The tramway terminus is located near to a bus station. 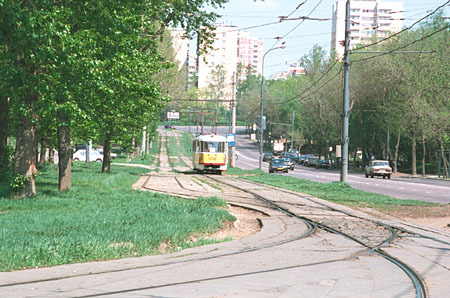 Many commuters use to make a transfer here from tram to bus/trolleybus or vice versa. The loop is equipped with signalling system controlling departure of trams for both tracks. In addition to the two terminus tracks, there is a short siding right after the exit switch. This siding can be used for temporary storage of vehicles during shunting.